Secondary salinity - salinity occuring as the result of man's activities - is a growing problem in much of Australia. Around every five years, the Australian Bureau of Statistics (ABS) conducts farmer surveys to obtain estimates of the amount of cleared land that has become too salinised to grow crops and pasture. This article compares data obtained in 1974, 1979 and 1989 from farmers in the south-west of Western Australia. ABS surveys farmers on an annual basis. Every five years, an extra question is added asking farmers to determine the area of salt-affected land that was previously used for crops and pasture. Farmers are also asked for the amount of cleared land and total farm area of their property. Shire totals are compiled by ABS. For further details of survey methods, please refer to Malcolm & Stoneman (1976), Henschke (1980) and George (1990). Chloropeth mapping was chosen to display the data. The percentage of saltland to cleared land, the percentage of saltland area in each shire expressed as a percent of total shire area and the change in saltland area per shire. Percentages have been mapped in the ranges less than one percent, one to less than 2.5 percent, 2.5 to less than five percent and five percent and above. 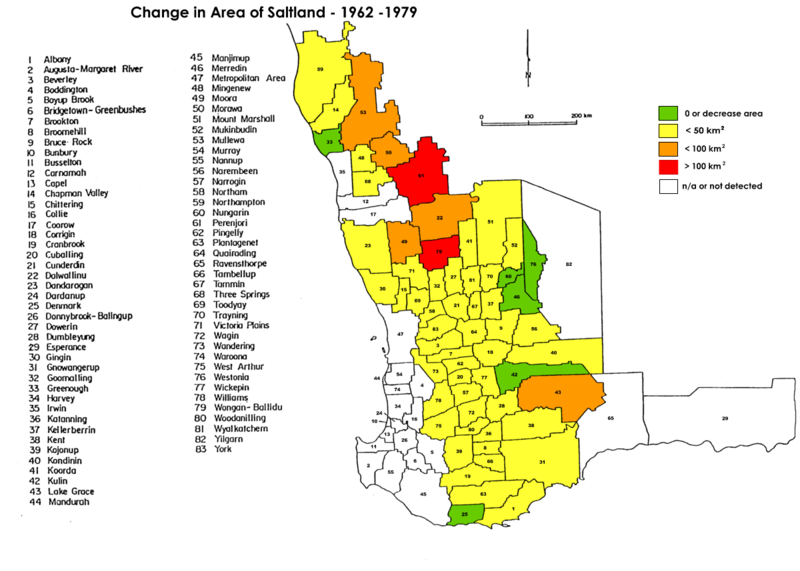 Changes in area of saltland were mapped in multiples of 50ha. 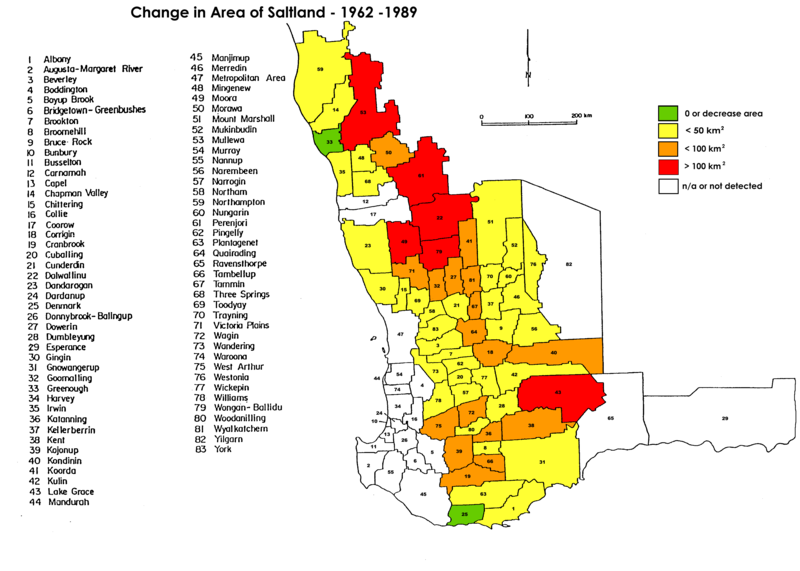 Figure One shows the change in saltland compared to cleared land over the years 1974, 1979 and 1989. As can been seen, the amount of saltland has increased - more cleared land in 1989 was too saline to grow crops compared to that in 1974. Numbers of shires suffering less than one percent salinity decreased from 50 in 1974 to 28 in 1989. During the same period, numbers of shires suffering moderate to severe secondary salinity (2.5% or more) rose from 8 in 1974 to 18 in 1989. No shires had more than 5% of salinised land compared to cleared land in 1974 yet 15 years later, 16 shires had more than 5% of total cleared land affected by salinity. The inland areas beyond the Darling Ranges are the worst affected, with increases from around one-two percent of cleared land being saline in 1974 to more than 5% in 1989 in a number of shires including Camamah, Morawa and Perenjori in central district, Katanning and Woodanilling in lower great southern district, Dowerin, Goomalling, Moora, Quairading, Tammin, Wongan-Balidu and Wyalkachem in midlands, Brookton, Narogin, Pingelly and Wagin in the upper great southern district. Areas near the coast generally had low levels of salinised land compared to cleared land - no shires in the south-west district showed significant areas of salting. 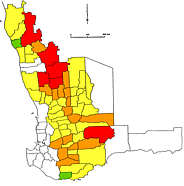 Figure One: Percentage of cleared land suffering dryland salinity in (l-r) 1974, 1979 and 1989. For further detail, click on the image. Red - > 5%, Orange - 2.5-5%, Yellow 1-2.5%, Green <1%. White indicates data was not available. Figure Two shows the change in area of saltland expressed as a percent of total shire area in each shire over 1974 to 1989. Again the amount has increased in a similar pattern to that in figure one but subtle differences can be seen in the distribution of saltland. 52 shires had little salinity (less than 1%) in 1974 but this number dropped to 32 in 1989. In 1974, two shires had moderate to severe salting of shire land, but by 1989, this had risen to 24. 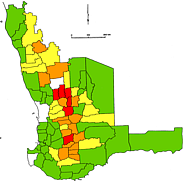 Figure Two: Percentage of shire area suffering secondary salinity in (l-r) 1974, 1979 and 1989. 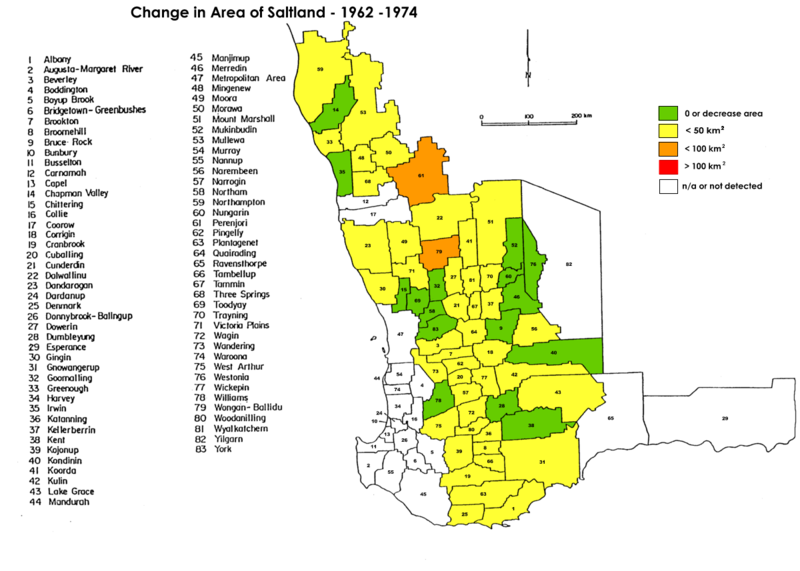 Figure Three shows the increase in area of saltland in each shire over between each period in the survey results for 1962-1974, 1962-1979 and 1962-1989. Again, the trend is to recruitment of salinised soil, particularly in the inland eastern and southern regions. In most areas, land suffering secondary salinity increased at most 50km2, although in 1979, seven shires had saltland increase by more than 50km2 since 1962, and in 1989, 23 shires had more than 50km2 more saltland than in 1962. Figure Three: Change in area of saltland per shire between 1962 and (l-r) 1974, 1979 and 1989. Red - >100km2, orange - 50-100km2, yellow - 0-50km2, green - decrease. White indicates data was not available. During the period surveyed, substantial increases have occurred in the amount of salinity in the study area. 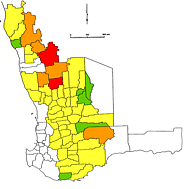 Only those shires in the coastal areas of the southwest and in the Perth area have shown little tendency towards increasing salinity. Inland areas have generally displayed an increase in salinity in all parameters surveyed. The current trend in salinity is an increase in area of salinised land. 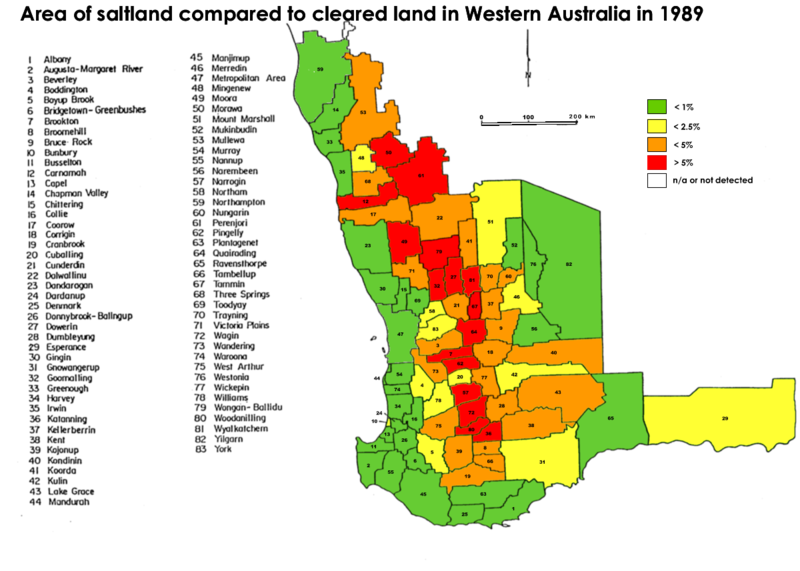 The amount of salinised land reported by farmers in Western Australia has increased from 167,294ha in 1974 to 443,441ha in 1989. The inland areas of the southwest are showing a rapid increase in the amount of salinised land. By 1989 2.83% of all cleared land was no longer productive agricultural land due to salinity. 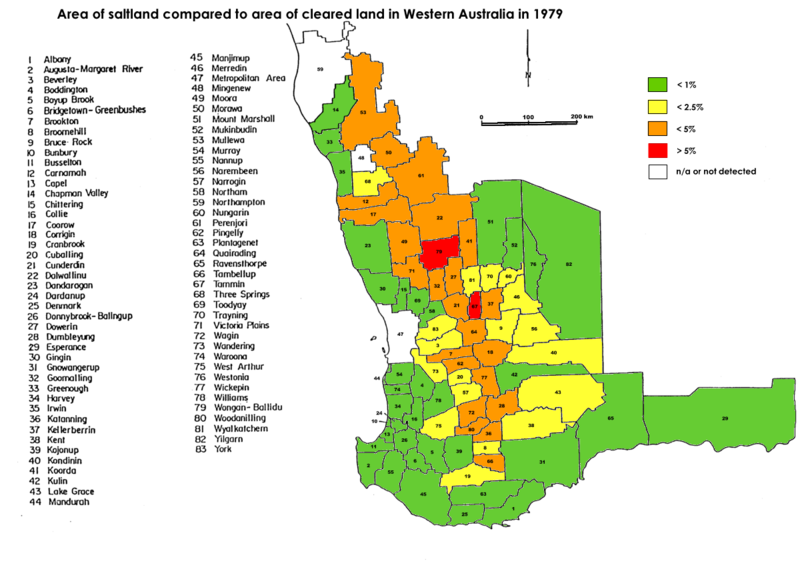 If the trend between 1974 and 1989 continued, it would be quite likely that more than 10% of all cleared land in Western Australia would become too saline to use for agriculture by 2000. 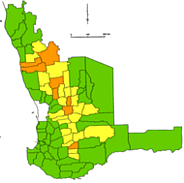 Western Australia was estimated to have around 9.4% of all cleared land suffering secondary salinity in 1994 in the south-west zone (the area discussed in this report). This is nearly 2 million hectares of salt-affected land that had previously been capable of sustaining agriculture. By 2020, around 17% of cleared land will be degraded by secondary salinity (AGWEST 1999, Nulsen & Evans, 2000). Most of the secondary salinity problem is expected to occur in broad valley floors, where most agriculture takes place. A number of factors combine to help create secondary salinity. 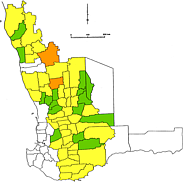 These include rainfall, groundwater recharge, landuse and vegetation type. In this study, the areas worst affected by secondary salinity are mainly in the so-called "wheat belt". These are areas that have been cleared for the growing of crops, typically wheat. Most of the areas have less than 600mm rainfall per annum - a typical feature of lands that are prone to suffering dryland salinity. The soils of the wheat belt are generally pale leached or gravelly sands. The original vegetation was forests or eucalypt woodlands. The removal of the deep-rooted native vegetation has disturbed the hydrological cycle, with the almost immediate effect of raising watertables. The form of land use affects the development of secondary salinity. 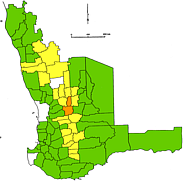 For example, approximately one third of the Esperance Shire comprises a national park, where no clearing may occur. This could be expected to have an ameliorating effect on salinity in that part of the shire. However, where clearing has occurred, the land is much more likely to develop secondary salinity. Salt lakes are common in many of the south-eastern shires in the study area. 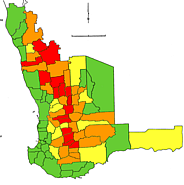 Further information concerning other factors such as the underlying geology, waterlogging occurrence, topography, evaporation rates during different times of year and patterns of rainfall, watertable heights and recharge rates and location of saline soils would be helpful in delineating the causes of secondary salinity in the south-west of Western Australia. The importance of these factors is detailed below. More information concerning the underlying geology would help in the explanation of the salinity problem. For example. some areas may have underlying rocky dykes that block the flow of groundwater or may have fractured bedrock that allows easy flow of groundwater. Waterlogging may contribute to the development of secondary salinity, so further details concerning this would be helpful. The topography of the area also influences the development of salinity. Flat land is prone to developing salinity in areas where evaporation is high but rainfall is low. Salt is not flushed out of the catchment and accumulates generally at the lowest point. Rainfall in inland areas generally deposits around 20kg of salt per hectare each year. Over a number of years, this is a considerable amount of salt waiting in the soil to be mobilised. Topography information therefore would also help explain the incidence of secondary salinity. Some areas, such as Lake Grace, may have had pre-existing (primary) salinity that has worsened as a result of agricultural practices. Information about the distribution of rainfall and evaporation rates would further help analysis of the areas affected by secondary salinity. In those areas where most of the rain falls in winter and evaporation rates are low, groundwater recharge occurs more readily as plants are not transpiring as much water as they might in midsummer. 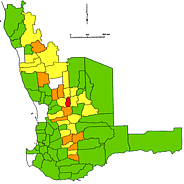 Perth has winter-dominant rainfall and temperatures are lower in winter, so it is probable that groundwater recharge in much of the south-west of Western Australia is high in winter. The distribution of naturally saline soils may reflect the development of secondary salinity. The local native vegetation may have been adapted to life on saline soils, but many crops are not tolerant of saline soils. Watertables are generally rising in Western Australia, although there are some instances of a decrease in watertable height (NDSP 2000). Wherever groundwater recharge occurs, watertables rise. Watertables can rise after storm events in step-like jumps but the magnitude of these may be decreased under deep-rooted perennial vegetation such as trees and some grasses. However, shallow-rooted crops and pastures allow much greater groundwater recharge than native vegetation or introduced deep-rooted plants, showing an influence of vegetation type on local hydrology. Current research indicates that approximately half a catchment must be under trees to decrease groundwater discharge by half. This is a significant amount lost farm production land. However, if salinisation continues in currently productive farmland, further losses will be made. The ABS survey is a voluntary survey of farmers. As such, it relies on the farmers understanding the question asked and being truthful in their reply. In 1979, 24% of all farmers sent the survey replied to the salinity question. In 1989, 39% of the total surveyed returned the questionnaire replied to the salinity question. The failure of others to respond may be that the questionnaire takes too long to complete or the respondents are unwilling to supply or do not have the information requested or simply that it was overlooked. The survey does not require specialised equipment or people with specific knowledge to collate the results contributing to it being easy to perform and inexpensive. It can be directly compared to the previous survey(s) and future survey(s). It reflects farmer awareness of the problem. no definition of the meaning of saltland was provided. As reported in George, 1990, farmers tend to include naturally saline soils (ie those soils that were salinised before farming activity) in the total area of soil that was once productive but now has become unsuitable for agriculture. Also, cropping paddocks that have saline patches are often thought not to be available for any agriculture, whilst it would probably be possible to plant salt-tolerant pastures on that land. Waterlogging may have the same effect on agriculture as does salinisation - the farmer cannot grow crops or place the area under good pasture, and this may further confound results. Other alternatives that may be used for the appraisal of dryland salinity include GIS and other methods of interpreting ground cover and vegetation types (eg aerial photos). These could measure both rate of change in vegetation type and cover along with development of salinity scalding. Groundwater depth and salinity could be monitored, most likely by farmers. If monitored by farmers, there could be a number of problems such as insufficient training in techniques required to take measurements, misrepresentation of data in order to understate the problem, peer pressure to present "good" data or simply to indicate that the farm has little salinity problem, recruitment of farmers to consistently take measurements (time/workload factor) and so on. Combinations of data such as results of farmer surveys, GIS/geospatial information, watertable information and so on may provide the most accurate forms of appraisal, however, will require more coordination, more money and specialised techniques. George, R. 1990. 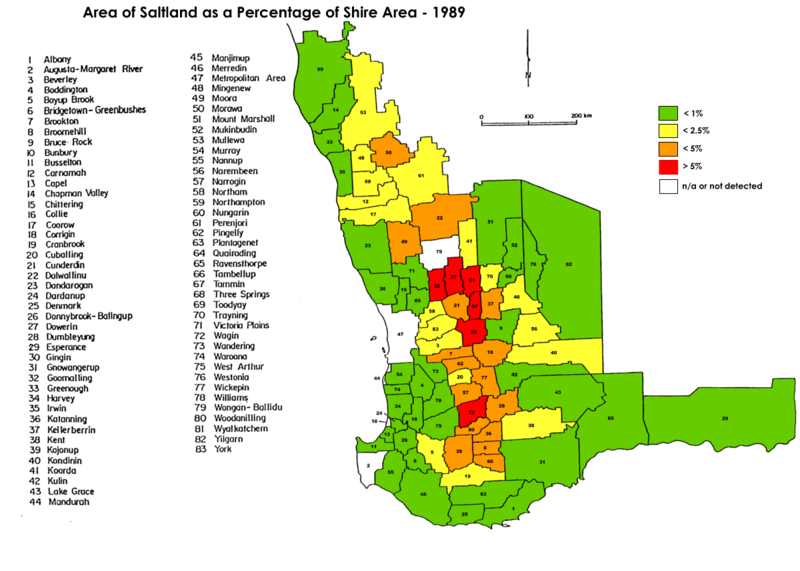 The 1989 saltland survey. J of Agriculture WA 31: 159-167. Henschke, CJ. 1980. Saltland in statistics...the 1979 saltland survey. J of Agriculture 21: 116-119. Malcolm, CV, and Stoneham, TC 1976. Salt encroachment - the 1974 saltland survey. J of Agriculture WA 17:42-49.